Being able to extract data from a compressed file is highly important. If a file is too large, the content size can be reduced. Once you receive the file you will then have to extract it from its compressed format to view the data. In this case, you will need an application that can compress and extract this type of data. 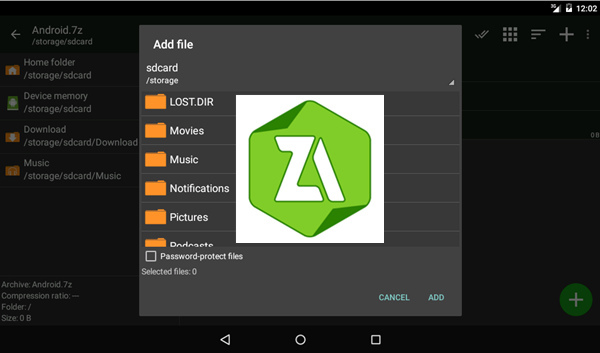 ZArchiver manages all your compressed data, and is designed to work with Android devices that are 2.0 and higher. This application is user friendly, so you do not have to be tech savvy to use it. ZArchiver will help you access the data that you need without all the headache. The designers of ZArchiver ensure that this application functioned, and possessed all the key features that would be needed to efficiently manage your data. Extract and compress any data that is protected with a password. Efficiently make changes to the data, including adding or removing files to the compressed data saved in zip, 7zip, tar, apk, mtz formats. Ability to make and extract data that contains multiple archives. Extract only part of the data. Access the compressed file through an email application. Unzip data that is split, in 7z, zip and rar (7z.001, zip.001, part1.rar, z01) format. There are so any possibilities when it comes to using the ZArchiver application. It has been developed to efficiently work with various processors, in which multi-threading support is available. It gives you the ability to use national symbols when creating names for your data. Plus, you can compress all your data with ease. Simply click on the icon that is on the left side of the file name. Files that are sent to or fro can be very lengthy, which will cause a delay in receiving or sending of the data. To avoid these delays, data can be compressed and placed in a file that is much smaller, making it quick and easy to receive and send large files. In doing so, the person receiving or sending the file will have to extract the material before viewing it. ZArchiver will help you access or send these types of files. ZArchiver has made it easy to access the data that you need quickly. All functions are labelled and easy to understand. You will not have to worry with guessing how to extract or compress a file. Gadzooks Software Copyright © 2019.